When your profit is on the line, having an accurate and reliable measurement of the quantity and quality of crude oil, water or other liquids is vital. That’s why the world’s leading producers and mid-stream companies trust UMC LACT Units. The primary purpose of a Lease Automatic Custody Transfer unit or LACT unit is to analyze, meter and measure the quantity and quality of crude oil, water or other liquid. LACT systems allow for automatic measurement, sampling and transfer of these liquids from a wellhead or lease location to a pipeline. Because crude oil is ultimately sold on a calculation of temperature, basic sediment and water (BS&W), API gravity, and overall volume, it is therefore critical that all of these measurements be accurate and reliable. 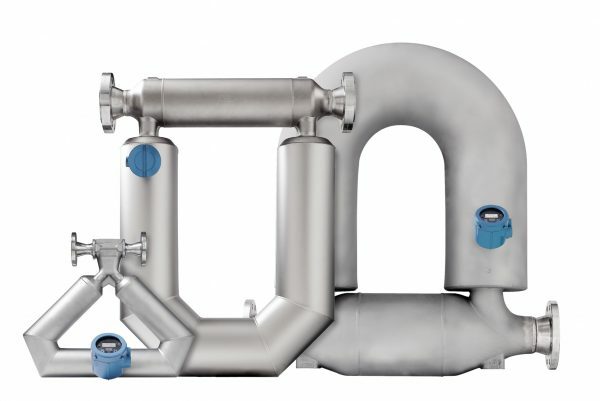 We are proud to be an Emerson Micro Motion and Rosemount Flow Strategic Partner utilizing Coriolis, Density, Magnetic and Vortex flow technologies to provide end users with most accurate and reliable O&G flow measurement solutions. We’ve delivered thousands of LACT units to some of the harshest and most remote locations in the world, including Russia. Our units were among the first operating in the Bakken Shale, and we now have one of the largest market shares in that region. With fiberglass, heat-traced or metal housing, we make sure your LACT units are covered and built-to-last, no matter what Mother Nature throws at you. Need to get in the pipeline? You don’t need to purchase and engineer multiple skids. Let UMC provide you a one-stop, turn-key solution. All of our packages are available with a wide variety of pump technologies, thanks to our wide-reaching industry relationships. We give you total flexibility for the perfect fit at an ultimately lower cost. UMC provides a complete suite of Quality Assurance options, from full-function “Wet Tests” of each system that leaves our facility, to capabilities that allow SCADA systems across the world to control the units in our facility before shipment. Our state-of-the-art facility boasts completely separate x-ray and hydrotest buildings as well, ensuring our 100% Quality Assurance guarantee is met, every time. Tank gauging requires a shake-out along with an accurate BS&W calculation and analysis. Tank gauging requires an accurate average temperature analysis and calculation. Tank gauging requires production to be shut-in to the tanks. Of course, the greatest effect on crude oil volume is temperature, as crude oil expands and contracts at a rate of approximately 2% per every 40 F change in temperature. Tank gauging cannot capture these changes and it is therefore commonly accepted that tank gauging often affects the overall volume sold by up to 2%. 2% may not seem like much until you look at the losses on an annual basis. Consider the example shown in this chart, based on daily volume at a rate of $50.00 per barrel. As you can see, as time goes on tank gauging amounts to millions of dollars in lost revenue. 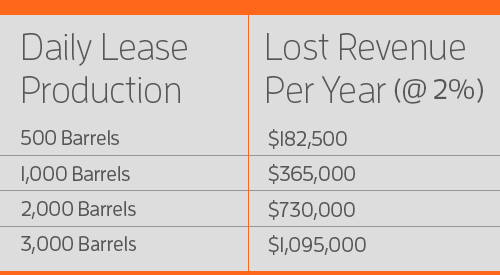 Avoid these losses with reliable metering and measurement from a UMC LACT unit. We’re ready to help you design a solution that meets your specific needs.